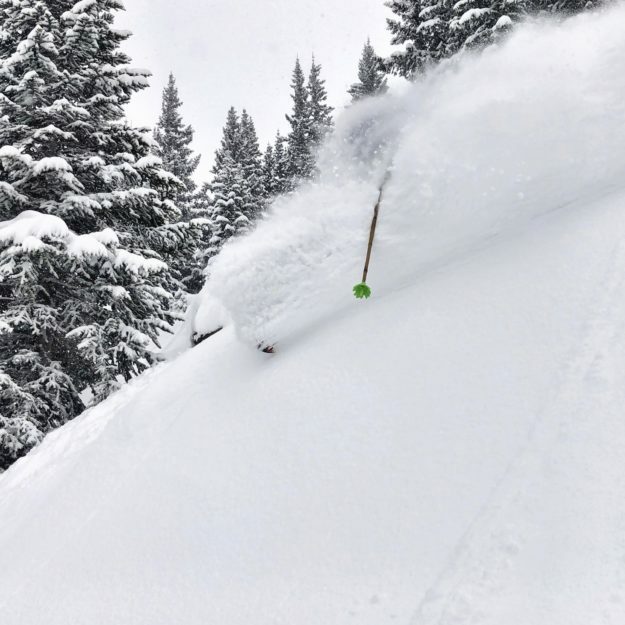 Upper Snag at Vail on Thursday (Chris Bivona, Vail Resorts photo). Editor’s update: Officials have confirmed skiing to Redtail finish area beginning Friday. Vail opened Blue Sky Basin on Thursday – its second earliest opening ever – and Beaver Creek is on the verge of opening Redtail, which would allow skier access to Friday’s Birds of Prey World Cup downhill and possibly new lift openings for Larkspur and Grouse Mountain soon. New snow overnight Wednesday into Thursday (officially only around 3 or 4 inches but it skied much more like 7) forced cancellation of Thursday’s downhill training run, and more snow forecast throughout the weekend caused race officials to shuffle the schedule – swapping the super-G and downhill races. The super-G – a more technical race with a little less speed — had originally been scheduled for Friday, with the premier downhill event on Saturday, but weather forecasters are calling for heavy snow on Saturday and lighter snow on Friday. Another storm is then moving in Sunday morning, which could impact the Birds of Prey giant slalom. “On Thursday morning you’ll find a moderate powder day at most central and northern mountains with 2-7 inches of freshies thanks to Storm #1,” meteorologist Joel Gratz wrote on Opensnow.com Wednesday morning. “Then Storm #2 will bring snow to all mountains from Thursday night through Saturday midday and Storm #3 will arrive on Sunday morning and will favor the southern mountains. Next week, our best chance for the next storm is on Friday, then after a few days of dry weather, another storm is likely around December 12th,” Gratz added.